The treatment of diabetic macular edema (DME) has become one of the most challenging management issues faced by ophthalmologists in daily practice. This is partly due to the multifactorial nature of DME, progression of the disease and the clinical capacity needed to administer intravitreal injections. In recent years, the treatment options for DME have expanded to include intravitreal injections of anti-vascular endothelial growth factor (VEGF) agents and steroids, and most recently, the use of intravitreal implants. In determining clinically relevant endpoints for clinical studies of these treatments, it is important to consider the patient’s journey and experience with a treatment over a specific time-period rather than isolated outcomes at a pre-specified time-point. Area under the curve (AUC) is an ideal tool for data analysis particularly when it comes to sustained release therapies such as dexamethasone (Ozurdex®, Allergan Inc., California, US) and intravitreal fluocinolone acetonide implant (0.2μg/day FAc implant; Iluvien®, Alimera Sciences Inc., Georgia, US). Unlike single time-point outcomes, AUC analysis provides the average letters gained per day over the entire treatment period, providing a better measure of long-term effectiveness. A recent analysis using the AUC approach highlights the significant visual acuity benefit resulting from the 0.2μg/day fluocinolone acetonide (FAc) implant during the FAME (Fluocinolone Acetonide for Macular Edema) trials. A step-by-step instruction is included in this article that allows statistical analysis of the AUC data from both functional and anatomical outcomes, using a free software tool to further facilitate the use of this technique for future investigators. Sepehr Bahadorani has nothing to declare in relation to this article. Michael Singer would like to disclose consultant speaker research for Allergan, consultant speaker research for Genentech, speaker research for Regeneron and consultant research for Alimera Sciences. The publication of this article was supported by Alimera Sciences, who was given the opportunity to review the article for scientific accuracy before submission. Any resulting changes were made at the authors’ discretion. Vascular exposure to hyperglycemia over extended periods, destroys the retinal endothelial cell tight junctions and leads to the development of macular edema with consequent visual loss.1 Indeed, diabetic macular edema (DME) is the most common cause of visual impairment in diabetic patients.2 At the same time, considering that the incidence of diabetes is on the rise, it becomes prudent to effectively address DME. According to the World Health Organization (WHO) study, the global incidence of diabetes has risen from 108 million in 1980 to 422 million in 2014 and attributes to 2.6% of global blindness.3 These estimates are expected to rise further due to the increasing prevalence of diabetes, ageing of the population and the increasing life expectancy of those with diabetes. Until recently, the standard of care for DME was laser photocoagulation, which slows progression of vision loss but rarely results in improvement of vision, even after 3 years of treatment. According to the Early Treatment of Diabetic Retinopathy Study (ETDRS), laser treatment of clinically significant macular edema (CSME) decreases the risk of moderate vision impairment (15 letters) by half over 3 years.4 Nonetheless, the introduction of intravitreal pharmacologic agents, namely the anti-vascular endothelial growth factor (VEGF) agents and corticosteroids, has changed the prognosis of DME from stabilization of vision to improvement. The next section focuses on the use of area under the curve (AUC) as an effective means of assessing the efficacy of sustained-release medications, most notably the longer-acting steroids, dexamethasone and fluocinolone. In particular, considering the gradual decrease in the vitreous concentration of sustained-release medications, the AUC analysis is highly recommended for evaluating the continuous effects of these medications. Indeed, in a pair of 3-year, phase III randomized, shamcontrolled trials, the efficacy of dexamethasone implants (0.35 mg and 0.7 mg) in DME patients has been evaluated using the AUC method.45,46 The results of these trials have been presented in the European public assessment evaluation of dexamethasone implant (Table 1).47 The AUC was the primary efficacy measure. In one of these studies (206207- 010, n=494), the average number of BCVA letters gained per day (AUC approach) was significantly greater with dexamethasone implant 700 compared with sham (difference of 2.1, 95% CI: 0.4–3.8, p=0.016) and with dexamethasone implant 350 compared to sham (difference of 2.3, 95% CI: 0.5–4.0, p=0.010).47 In the other study (206207-011, n=554) the mean BCVA change from baseline was 2.9 with dexamethasone implant 700 compared to 2.0 with Sham (difference of 0.8 letters, 95% CI: -0.9–2.4, p=0.366). The AUC was 2.9 with dexamethasone implant 350 compared with 2.0 with sham (difference of 0.7, 95% CI: -0.9–2.4, p=0.396). The differences were not statistically significant indicating that one of the two trials failed its primary endpoint. These studies demonstrate how the AUC method is regaining popularity, particularly in the context of longer-acting medications. In the MEAD study, the statistically significant difference disappears in terms of BCVA of the total group of dexamethasone implants versus sham group at around month 18 to month 36 months post-initiation of the study (this is presumably due to cataract formation).46 Although the BCVA of 0.7 mg implants once again significantly improved from the sham arm at 36–39 months of treatment, this example shows how endpoint mean measurements based on the single time point of final BCVA may be misleading. The PLACID study is another relevant trial comparing DEX (0.7 mg) combined with laser photocoagulation to laser alone for the treatment of DME.48 While there was no statistical difference between the treatment groups at month 12, AUC analysis of BCVA depicts a significantly greater improvement in BCVA of the combined treatment group. The most feasible explanation for BCVA decline with the dexamethasone implant is due to a gradual decrease in the vitreous concentration of steroids49 and consequent dilution of final outcome measurements towards the end of the trial. Cataract formation could be argued as a source of the decline in terms of vision, but retinal thickness also declines, showing that it is a drug-related effect. Therefore, it is essential to analyze the overall trend of BCVA improvement in studies using sustained-released medications to determine the efficacy of the treatment. It is worth noting that AUC analysis only interprets the overall statistical significance of a treatment rather than specific time points during the period of study. Hence, this form of analysis may not be suitable for studies that are interested in evaluating early effects rather than long term overall effects, in that early effect of a treatment could be diluted by long term data and lose its statistical significance. Therefore, for these situations, linear or generalized mixed models may be used as an alternative approach to flexible analysis of correlated data. Considering that the 0.2 μg/day FAc implant is a new generation of sustained-release steroid implant, most of what we know from the effects of this medication comes from European studies, in that, the launch of the 0.2 μg/day FAc implant in Europe preceded that in the US by 2 years. Here follows a summary of the 0.2 μg/day FAc implant studies. AUC analysis indicates that the 0.2 μg/day FAc implant produced significant benefits compared with sham control. The changes in DME were consistently seen in both the FAME A and FAME B trials and were greater (p=0.029) than those observed with other sustained release steroids such as dexamethasone implant 700 but were achieved with fewer injections (1.3 in FAME versus 4.1 in MEAD). This analysis demonstrated that the AUC method captures treatment benefit over the entire dosing period which is particularly appropriate for studies of extended duration. Besides the FAME trials, another recent study tested the effects of fluocinolone intravitreal implant in DME patients that were resistant to laser and anti-VEGF therapies in a real-life setting. The study tests the effects of the 0.2 μg/day FAc implant in two different groups of patients: group 1 with prior laser-only treatment (n=7 eyes), and group 2 comprised of patients with a prior combination of laser and ≥3 monthly anti-VEGF therapy (n=10 eyes). At 12 months following administration of the 0.2 μg/ day FAc implant, DME decreased by 299 μm in group 1, and by 251 μm in group 2. The analysis used the AUC method to measure changes in BCVA, where 0.2 μg/day FAc implant treatment increased the mean area under the curve for pseudophakic patients from baseline to last value by +4.2 letters in group 1 and +9.5 letters in group 2.54 This showed a greater improvement in vision in patients who had previously received both laser and anti-VEGF therapy. The lack of resources or knowledge is one of the main limitations to the use of AUC statistical analyses. Here, with hopes of providing more liberty to future investigators for using this statistical method, we are providing a cost-free approach with step-by-step instructions to analyze the AUC data using the R Statistical Software. The provided codes will analyze the data using one-way ANOVA followed with a pairwise t-student post-hoc test corrected with the Holm’s sequential method to reduce the probability of type I error. Step 1) Download “AUC.r”, “AUC_example.r”, and “YWZ.csv” from the supplementary section of this article. Step 3) Run the installer and follow the instructions. Step 6) Click the “Open an existing file” icon (or press “Ctrl+O”) to open the “AUC.r” as well as “AUC_example.r” script with RStudio. Step 7) Import the YWZ.csv data by clicking on the “Import Dataset” icon . The file must be saved in the R directory (which is usually located in the “documents” folder). Allow the program to install any required packages for importing .csv data. Browse and select your “YWZ” file from R-directory and then click import. Step 9) Click on the “AUC_example.r” script , place the cursor on the first line, and execute the codes line-by-line all the way to the bottom by either clicking Run or “Ctrl+R”. Step 10) In the console section at left-bottom of the page, p-values are listed for statistical comparison of Y, W, and Z graphs. • You can modify numbers or add/delete rows in the YWZ.csv file. Please make sure to save the archive and re-import it to R from R-directory. • Y, W, and Z each represent a separate variable (e.g., Implants) with their numeric outcome listed in front of them. The numbers in front of “TROT”, on the other hand, represent the timeline. All these values can be modified accordingly to incorporate your raw data for AUC calculations. • If you decide to add or subtract columns in your timeline (TROT), you must also adjust the mm matrix, (i in 2:12), and c(11,11,11) values in the “AUC_example.r” file. As a result of improved understanding of the pathophysiological processes responsible for endothelial blood–retinal barrier breakdown in DME, new therapeutic options have emerged. Several VEGF inhibitors, including aflibercept, bevacizumab, pegaptanib and ranibizumab, have shown clinical efficacy as intravitreal therapies for DME. In addition, the 0.2 μg/day FAc implant and DEX are available as intravitreal implant systems releasing steroid for up to 36 months10, 39 and 4 to 6 months,55 respectively. However, variation in clinical endpoints can hinder comparisons of clinical trials of these agents and often only account for outcomes at a single time-point. As an alternative approach, the AUC method captures treatment benefit over the entire dosing period. Most DME subjects require treatment for multiple years, thus the AUC method is particularly relevant to assess therapies for DME. 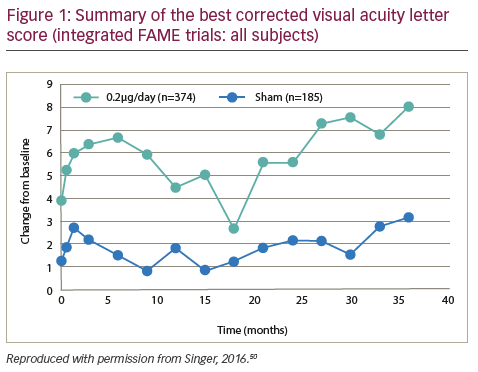 Using the AUC method, a significant visual acuity benefit that resulted from 0.2 μg/d FAc versus sham control during the FAME trials was demonstrated. In addition, the similarity between AUC and change in mean BCVA at month 36 supports the consistent benefit with continuous 0.2 μg/d FAc therapy. A recent analysis of data from the FAME trials using the AUC method highlights the sustained benefits of the 0.2 μg/day FAc intravitreal implant in the treatment of DME. The AUC method therefore provides a complete assessment of efficacy over time and is particularly relevant for evaluating outcomes over a continued period of therapy. 1. Antcliff RJ, Marshall J, The pathogenesis of edema in diabetic maculopathy, Semin Ophthalmol, 1999;14:223–32. 2. Bhagat N, Grigorian RA, Tutela A, et al., Diabetic macular edema: pathogenesis and treatment, Surv Ophthalmol, 2009;54:1–32. 3. WHO, Global report on diabetes. Available at: apps.who.int/iris/ bitstream/10665/204871/1/9789241565257_eng.pdf (accessed January 13, 2017). 5. Rodrigues SF, Granger DN, Blood cells and endothelial barrier function, Tissue Barriers, 2015;3:e978720. 6. Campochiaro PA, Peters KG, Targeting Tie2 for Treatment of Diabetic Retinopathy and Diabetic Macular Edema, Curr Diab Rep, 2016;16:126. 7. Bolinger MT, Antonetti DA, Moving Past Anti-VEGF: Novel Therapies for Treating Diabetic Retinopathy, Int J Mol Sci, 2016;17:pii: E1498. 8. Diabetic Retinopathy Clinical Research N, A randomized trial comparing intravitreal triamcinolone acetonide and focal/grid photocoagulation for diabetic macular edema, Ophthalmology, 2008;115:1447–9. 9. Haller JA, Kuppermann BD, Blumenkranz MS, et al., Randomized controlled trial of an intravitreous dexamethasone drug delivery system in patients with diabetic macular edema, Arch Ophthalmol, 2010;128:289–96. 10. Campochiaro PA, Brown DM, Pearson A, et al., Sustained delivery fluocinolone acetonide vitreous inserts provide benefit for at least 3 years in patients with diabetic macular edema, Ophthalmology, 2012;119:2125–32. 11. Campochiaro PA, Nguyen QD, Hafiz G, et al., Aqueous levels of fluocinolone acetonide after administration of fluocinolone acetonide inserts or fluocinolone acetonide implants, Ophthalmology, 2013;120:583–7. 12. Brown DM, Nguyen QD, Marcus DM, et al., Long-term Outcomes of Ranibizumab Therapy for Diabetic Macular Edema: The 36-Month Results from Two Phase III Trials: RISE and RIDE, Ophthalmology, 2013;120:2013–22. 13. Massin P, Bandello F, Garweg JG, et al., Safety and efficacy of ranibizumab in diabetic macular edema (RESOLVE Study): a 12-month, randomized, controlled, double-masked, multicenter phase II study, Diabetes Care, 2010;33:2399–405. 14. Mitchell P, Bandello F, Schmidt-Erfurth U, et al., The RESTORE study: ranibizumab monotherapy or combined with laser versus laser monotherapy for diabetic macular edema, Ophthalmology, 2011;118:615–25. 15. Rajendram R, Fraser-Bell S, Kaines A, et al., A 2-year prospective randomized controlled trial of intravitreal bevacizumab or laser therapy (BOLT) in the management of diabetic macular edema: 24-month data: report 3, Arch Ophthalmol, 2012;130:972–9. 16. Chakravarthy U, Adamis AP, Cunningham ET Jr., et al., Year 2 efficacy results of 2 randomized controlled clinical trials of pegaptanib for neovascular age-related macular degeneration, Ophthalmology, 2006;113:1508 e1–25. 17. Do DV, Nguyen QD, Boyer D, et al., One-year outcomes of the da Vinci Study of VEGF Trap-Eye in eyes with diabetic macular edema, Ophthalmology, 2012;119:1658–65. 18. Lien S, Lowman HB, Therapeutic anti-VEGF antibodies, Handb Exp Pharmacol, 2008;131–50. 19. Ranieri G, Patruno R, Ruggieri E, et al., Vascular endothelial growth factor (VEGF) as a target of bevacizumab in cancer: from the biology to the clinic, Curr Med Chem, 2006;13:1845–57. 20. Scott IU, Edwards AR, Beck RW, et al., A phase II randomized clinical trial of intravitreal bevacizumab for diabetic macular edema, Ophthalmology, 2007;114:1860–7. 21. Terasaki H, Sakamoto T, Shirasawa M, et al., Penetration of bevacizumab and ranibizumab through retinal pigment epithelial layer in vitro, Retina, 2015;35:1007–15. 22. Genetech Inc., Avastin (bevacizumab) solution for intravenous infusion prescribing information., 2016. Available at: www.gene. com/download/pdf/avastin_prescribing.pdf (accessed Mar 7, 2017). 23. Avery RL, Castellarin AA, Steinle NC, et al., Systemic pharmacokinetics following intravitreal injections of ranibizumab, bevacizumab or aflibercept in patients with neovascular AMD, Br J Ophthalmol, 2014;98:1636–41. 24. Ferrara N, Damico L, Shams N, et al., Development of ranibizumab, an anti-vascular endothelial growth factor antigen binding fragment, as therapy for neovascular age-related macular degeneration, Retina, 2006;26:859–70. 25. Xu L, Lu T, Tuomi L, et al., Pharmacokinetics of ranibizumab in patients with neovascular age-related macular degeneration: a population approach, Invest Ophthalmol Vis Sci, 2013;54:1616–24. 26. Nguyen QD, Shah SM, Heier JS, et al., Primary End Point (Six Months) Results of the Ranibizumab for Edema of the mAcula in diabetes (READ-2) study, Ophthalmology, 2009;116:2175–81 e1. 27. Pozarowska D, Pozarowski P, The era of anti-vascular endothelial growth factor (VEGF) drugs in ophthalmology, VEGF and anti-VEGF therapy, Cent Eur J Immunol, 2016;41:311–6. 28. Colquitt JL, Jones J, Tan SC, et al., Ranibizumab and pegaptanib for the treatment of age-related macular degeneration: a systematic review and economic evaluation, Health Technol Assess, 2008;12:iii-iv, ix–201. 29. Ciombor KK, Berlin J, Aflibercept--a decoy VEGF receptor, Curr Oncol Rep, 2014;16:368. 30. Heier JS, Korobelnik JF, Brown DM, et al., Intravitreal Aflibercept for Diabetic Macular Edema: 148-Week Results from the VISTA and VIVID Studies, Ophthalmology, 2016;123:2376–85. 31. Wells JA, Glassman AR, Ayala AR, et al., Aflibercept, Bevacizumab, or Ranibizumab for Diabetic Macular Edema: Two-Year Results from a Comparative Effectiveness Randomized Clinical Trial, Ophthalmology, 2016;123:1351–9. 32. Diabetic Retinopathy Clinical Research N, Beck RW, Edwards AR, et al., Three-year follow-up of a randomized trial comparing focal/ grid photocoagulation and intravitreal triamcinolone for diabetic macular edema, Arch Ophthalmol, 2009;127:245–51. 33. Chang-Lin JE, Attar M, Acheampong AA, et al., Pharmacokinetics and pharmacodynamics of a sustained-release dexamethasone intravitreal implant, Invest Ophthalmol Vis Sci, 2011;52:80–6. 34. FDA, Ozurdex - Prescribing information NDA 22315/S-009, 2014. Available at: www.accessdata.fda.gov/drugsatfda_docs/ label/2014/022315s009lbl.pdf date (accessed March 22, 2017). 35. Pacella F, Romano MR, Turchetti P, et al., An eighteen-month follow-up study on the effects of Intravitreal Dexamethasone Implant in diabetic macular edema refractory to anti-VEGF therapy, Int J Ophthalmol , 2016;9:1427–32. 37. Aknin I, Melki L, Longitudinal Study of Sustained-Release Dexamethasone Intravitreal Implant in Patients with Diabetic Macular Edema, Ophthalmologica , 2016;235:187–8. 38. Hall J, Correspondence, Retina , 2017;37:e34–e7. 39. Campochiaro PA, Brown DM, Pearson A, et al., Long-term benefit of sustained-delivery fluocinolone acetonide vitreous inserts for diabetic macular edema, Ophthalmology , 2011;118:626–35 e2. 40. Mourtzoukos S, The treatment of diabetic macular oedema (DMO) in UK real-life clinical practice with ILUVIEN ® (fluocinolone acetonide) – its impact on current clinical practice, Exp Rev Ophthalmol , 2017;12:95–7. 41. Pham B, Cranney A, Boers M, et al., Validity of area-under-the- curve analysis to summarize effect in rheumatoid arthritis clinical trials, J Rheumatol , 1999;26:712–6. 42. Cappelleri JC, Bushmakin AG, Zlateva G, et al., Pain responder analysis: use of area under the curve to enhance interpretation of clinical trial results, Pain Pract , 2009;9:348–53. 43. Gross JG, Glassman AR, Jampol LM, et al., Panretinal photocoagulation vs intravitreous ranibizumab for proliferative diabetic retinopathy: a randomized clinical trial, JAMA , 2015;314:2137–46. 44. Jampol LM, Glassman AR, Bressler NM, et al., Anti-vascular endothelial growth factor comparative effectiveness trial for diabetic macular edema: additional efficacy post hoc analyses of a randomized clinical trial, JAMA Ophthalmol , 2016;134. 45. Boyer DS, Yoon YH, Belfort R Jr., et al., Three-year, randomized, sham-controlled trial of dexamethasone intravitreal implant in patients with diabetic macular edema, Ophthalmology , 2014;121:1904–14. 46. Augustin AJ, Kuppermann BD, Lanzetta P, et al., Dexamethasone intravitreal implant in previously treated patients with diabetic macular edema: subgroup analysis of the MEAD study, BMC Ophthalmol , 2015;15:150. 47. European Medicines Agency, Assessment report (EPAR) - Ozurdex - International non-proprietary name: DEXAMETHASONE Procedure No. EMEA/H/C/001140/II/0015 EMA/492068/2014, 2014. Available at: www.ema.europa.eu/docs/en_GB/document_ library/EPAR_-_Assessment_Report_-_Variation/human/001140/ WC500173294.pdf (accessed March 2, 2017). 48. Callanan DG, Gupta S, Boyer DS, et al., Dexamethasone intravitreal implant in combination with laser photocoagulation for the treatment of diffuse diabetic macular edema, Ophthalmology , 2013;120:1843–51. 49. Herrero-Vanrell R, Cardillo JA, Kuppermann BD, Clinical applications of the sustained-release dexamethasone implant for treatment of macular edema, Clin Ophthalmol , 2011;5:139–46. 50. Singer MA, Efficacy Assessment of the 0.2 μg/day Fluocinolone Acetonide (FAc) Intravitreal Implants vs. Sham Control Using the Area Under the Curve (AUC) Method (FAME), Presented at the American Society of Retinal Physicians (ASRS) 2016 Annual Meeting, August 10-14, 2016, San Francisco, US. 52. Singer M, Efficacy assessment of the 0.2 mg/day fluocinolone acetonide (FAc) intravitreal implants vs. sham control using the area under the curve (AUC) method, Presented at: ASRS, San Francisco, US, Aug 9-14, 2016. 53. Elaraoud I, Maya J, Narendran N,et al., Efficacy assessment of ILUVIEN (0.2 μg/d Fluocinolone Acetonide) using the area under the curve method, Presented at EURETINA, Copenhagen, Denmark, Sep 8-11, 2016. 54. Massin P, Erginay A, Dupas B, et al., Efficacy and safety of sustained-delivery fluocinolone acetonide intravitreal implant in patients with chronic diabetic macular edema insufficiently responsive to available therapies: a real-life study, Clin Ophthalmol , 2016;10:1257–64. 55. Palla S, Biswas J, Nagesha CK, Efficacy of Ozurdex implant in treatment of noninfectious intermediate uveitis, Indian J Ophthalmol , 2015;63:767–70.